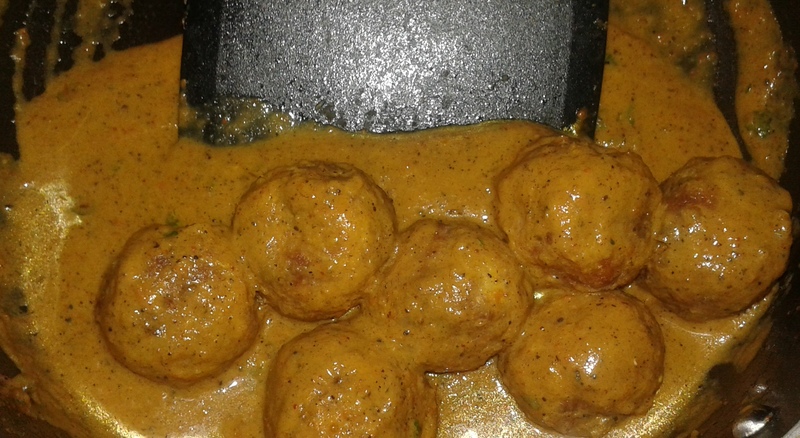 Recipe- Vegetable Kofta with Gravy! Vegetable Kofta Curry is a yummy and a delicious dish that can be prepared either with dry kofta balls or dipped and served in rich creamy gravy. These small vegetable balls known as Kofta’s can be fried, baked or pan fried before mixing it with gravy. Serve the delicious Vegetable Kofta Curry with Paratha or Rice of your choice. You can also serve these pan fried vegetable balls as an appetizer for your parties minus the gravy. I tried it myself and it turned out really well…Just follow the ingredients and method below and you too can prepare the lipsmacking dish in no time! Combine the boiled potatoes and mixed vegetables in a large bowl and mash them together well. Add the remaining kofta ingredients with the bread crumbs. Make 8 to 10 lemon-sized balls out of it. Roll each ball in over the corn flour so that they get coated evenly and get a crisp taste once cooked on the pan. Preheat the Non Stick with a teaspoon of oil and fry the kofta balls till they have begun to turn slightly brown. Flip over to cook on both sides the similar way. Heat a tablespoon of oil in a heavy bottomed pan and add ginger-garlic paste. Saute onions until the raw smell goes away but dont let the onions turn completely brown as it might float in the gravy. Add in the pureed tomatoes and the remaining ingredients for the gravy and simmer for 10 minutes until the tomatoes are cooked properly. Once the Kofta gravy has thickened, add in the pan fried Vegetable Kofta Balls and simmer for another couple of minutes. Transfer the Vegetable Kofta Curry into a serving bowl, garnish by drizzling with fresh cream and coriander leaves. Serve the dish with roti or rice over a dinner party and see the compliments you get for it.